This is the dissimilarity of faces in both the halves. It can be vertical or horizontal. The basic difference is due to the structure of the skeleton. You cannot differentiate the same in any of the other means. The operation can be done here, but there are several complications including the damage to the nerves. Whenever you utter the word asymmetrical, you are stating a relative term. You say the thing like that part is not symmetrical to the other one. In medical science too, the word Asymmetry is used to mean that any two parts, which was supposed to be similar, are actually not. There are four different cases, in medical science, related to symmetry. The four cases are listed here. Dental asymmetry it is the issue, where the sets of teeth of the upper and lower jaw are not in symmetry. Several issues like chewing problems and even pronunciation are seen in the cases. If it is for the kids, below the age of 4, some of the exercises for the jaws can cure the asymmetry. If it is not found at that age, surgery is the only solution. 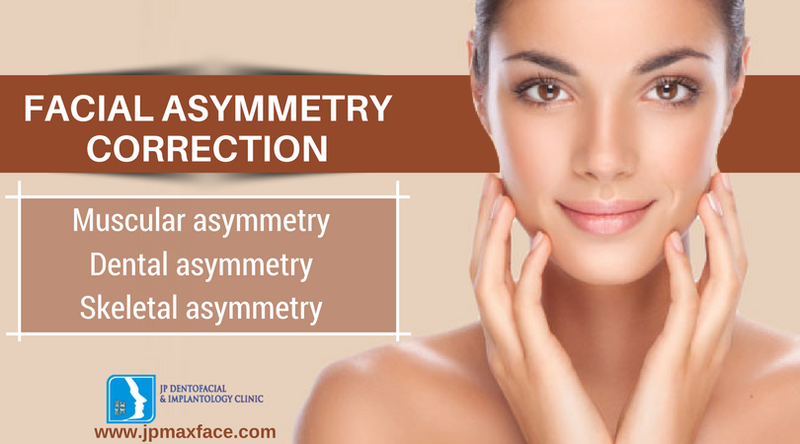 Skeletal asymmetry It is the issue, where the asymmetry is seen in the two side of the face. It can be an Asymmetry of the jaws, or can be in the cheeks. However, in most of the cases, the facial skeleton structure is different in the cheek and the paranasal area. In such cases, surgery is the only solution, where the shape of the face can also change. Muscular asymmetry It is the fact that very few are there in the world, who are having complete symmetry in muscular structure. However, some of the issues are stronger than others. You will find that as a disorder. Due to this disorder, the patient will be feeling it tough to chew foods, if that is in the dental area. In cases of chins, you will find a distorted shape in the face. Surgery can fix up the things, but you will also have to go for plastic surgery along with the implantation. Functional asymmetry This is the last type of asymmetry and is not often found generally. The operation that is needed here is different and more critical. Consultation with the best doctor is needed here, but more than that, consult with a psychiatrist for the support. Radiography Here panoramic therapy is used and is perfect for your treatment purpose. Anterior projection It is the latest invention and is commonly used in some of the nations. Cephalogram This is used for the lateral symmetry. It is one type of radiography and is highly effective for the treatment. There are other means of treatment too. Radiography is the latest method used and it is not common in all the nations. You can get in touch with your dentist for further information. He will guide you thoroughly.